Wedding Photos Mystic Seaport are nautical in essence. Mystic Seaport in Connecticut is a perfect place to hold a wedding during any season, but it is especially lovely during the months of summer and spring. This is because the warmer months are better for outdoor activities and photo opportunities with the boats and waterfront in the background. These Wedding Photos Mystic Seaport show just that. The sky is a bit overcast as the bridal party stands out on the edge of the water, but that doesn’t put a damper on the moods of couple and their closest friends. The group is lively and photographing them was a blast. They were all incredibly animated and reveled in the excitement of the day as they continued to celebrate the union of the bride and groom. 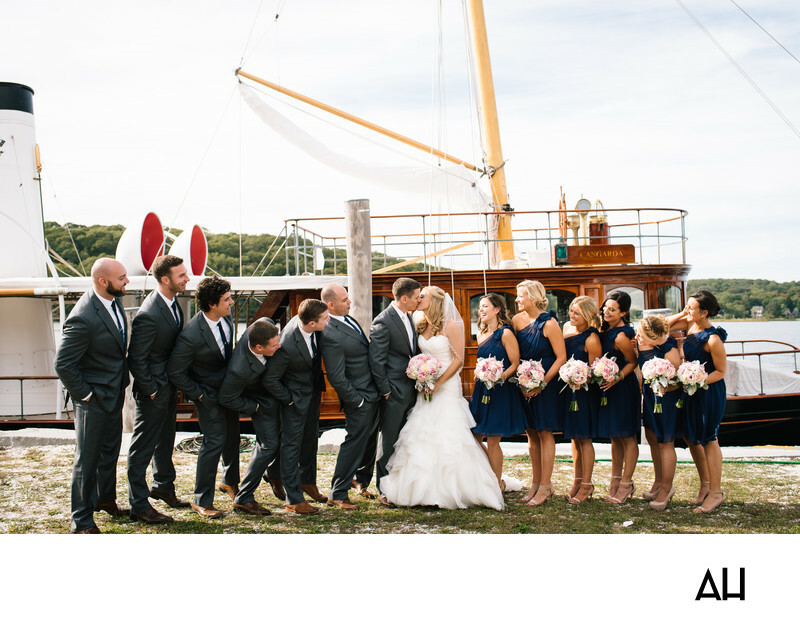 In this image the bride and groom stand among their bridal party on the docks of Mystic. The bride and groom share a romantic kiss with the groomsmen and bridesmaids looking toward them in delighted shock at this public display of affection. Behind the party, boats float lazily in the Mystic River. The groomsmen match the groom in charcoal gray suits, white dress shirts, and black ties. The bridesmaids wear short, navy dresses that flow in the breeze that gently blows off the water and across the shore. At the center the bride is stunning in her princess-like gown. Her blonde hair is lightly curled and pulled back by her sheer veil. Her gown is a work of art, pure white and layered ruffles at the bottom. She and the groom are surrounded with love today, and they are blessed with friendships that will stay with them for years to come.